"Six-star general" redirects here. For the 1973 record album of that name, see Vinegar Joe (band). For other high military ranks, see Highest military ranks. 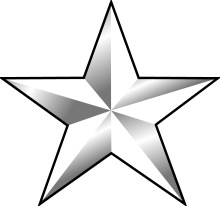 A six-star rank was a proposed special grade immediately superior to a five-star rank. 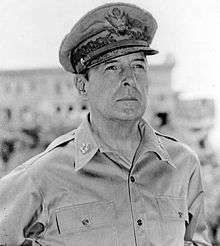 On 21 January 1955, the US Senate considered a joint resolution "To authorize the appointment of General of the Army Douglas MacArthur as "General of the Armies of the United States". 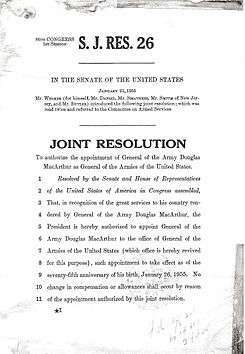 The resolution stated that this was "in recognition of the great services to his country" he had rendered, and that "the President is hereby authorized to appoint General of the Army Douglas MacArthur to the office of General of the Armies of the United States (which office is hereby revived for this purpose), such appointment to take effect as of the seventy-fifth anniversary of his birth, January 26, 1955." The proposal was shelved and never took effect. Recently, a few authors have described this proposed rank as a six star rank. George Washington was posthumously promoted to the rank of "General of the Armies of the United States" in 1976. Although the law did not actually specify the number of stars, some U.S. newspapers and Congressional politicians describe this as a six-star rank. His appointment had been to serve as "General and Commander in chief of the Army of the united Colonies". ↑ US Senate Joint Resolution 26, 21 January 1955. ↑ Weintraub, Stanley (2007). 15 Stars: Eisenhower, MacArthur, Marshall: Three Generals Who Saved the American Century. Simon & Schuster. p. 488. ISBN 9781416545934. A few MacArthur devotees in Congress, like Representative Martin, tried to organize support for honorary six-star rank for the general, but as that would have been a slap at Eisenhower, such legislation had no chance. ↑ Korda, Michael (2009). Ike. HarperCollins. p. 190. ISBN 9780061744969. 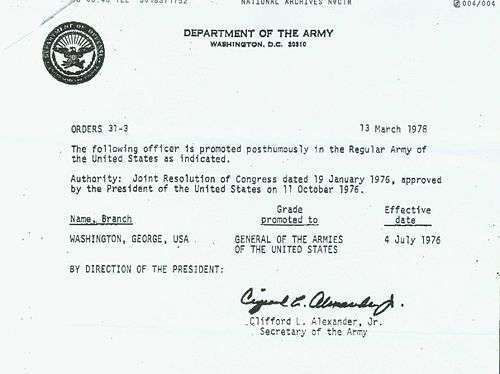 Congress would twice try to promote him from the new rank of General of the Army—a five-star general—to the unique rank of General of the Armies: a proposed six-star general. ↑ Department of the Army Order 31-3, (13 March 1978). Department of the Army order to enact Public Law 94-479. ↑ Dooley, Joseph (April 6, 2013). "Sunday Reflection: How the 'indispensable man' became America's only six-star general". Washington Examiner. ↑ United Press International (October 12, 1976). "George Washington Wins Promotion to Six-Star Rank". Eugene Register-Guard. Eugene, Oregon. p. 7A. Retrieved March 1, 2014. ↑ Kilian, Michael (August 5, 1976). "Foursquare opposed to a six-star Washington". Chicago Tribune. p. A2. ↑ Dooley, Joseph (April 6, 2013). "Sunday Reflection: How the 'indispensable man' became America's only six-star general". Washington Examiner. Rep. Frank Wolf, R-Va., ... noted, [Washington] is "the only six-star general in the nation's history."